Our ice cream machine has a wide operation range and is very flexible. consumption, remarkable energy saving effect, if using freezing or cooling juice or mix to ice cream, it will have a better effect. With its novel design, the product shows luxury, attractive and hygienic appearance. The storage tanks can be used for storing different flavoring, help user to make fried yogurt or ice cream roll in different flavor. 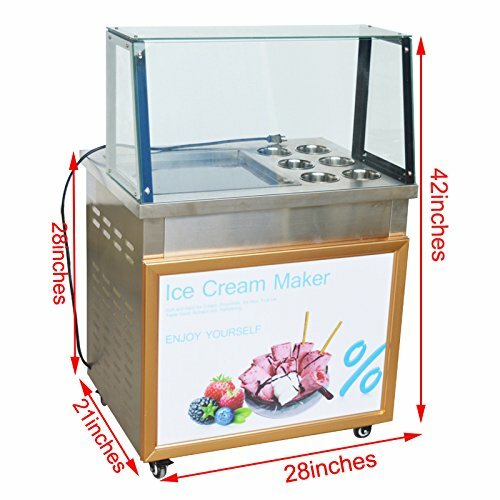 The making process for making ice cream is very attractive, and will attract many customers to come, watch and taste. Our ice cream machine is the ideal equipment for the self-employed, and it is also a necessary equipment for hotels, bars and cold drink shops. Our ice cream machine is with good performance, fast freezing speed, long service life, high efficient, energy saving and dynamic endurance. The fry pan is made of deeper and thicker stainless steel, and matching with the professional shovels, can save time and energy, the efficiency is 3 times higher than the regular one. If you have any questions about this product by C.N., contact us by completing and submitting the form below. If you are looking for a specif part number, please include it with your message.